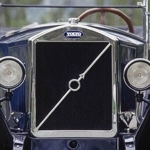 When the decision was taken to start producing Volvo cars in August 1926, financial backer Svenska Kullagerfabriken – SKF – reactivated a company that had been idle since 1920 for the purpose. The name of that company was VOLVO and it had been formed in 1915 for the manufacture and marketing of bearings for the automotive industry. Some smart member of the SKF management had come up with the VOLVO name. Not only was the name ingeniously simple, it was also easy to pronounce in most places around the world and with a minimal risk of spelling errors. And best of it all was its immensely strong symbolic connection to the company's entire operations. "Volvere" is the infinitive form of the verb "roll" in Latin. In its first person singular form, the verb "volvere" becomes "volvo", i.e. "I roll". Its Latin form gives rise to several derivations of the word that in one way or another, and in many languages too, describe a rotating movement, for instance, revolver. When operations started, they were described as follows: "Ball bearings, roller bearings, machines, transmissions, automobiles, bicycles, rolling-stock, transportation devices, means of transport of all kinds and parts of and accessories for the aforementioned products". All those things were not realised but quite a few Volvo automobiles and other transportation devices have been produced over the years. Some other products that also carried the Volvo brand name are such oddities as producer-gas burners, camping trailers and office chairs. And the name still suits the company’s operations perfectly. At the same time as VOLVO was reactivated, the ancient chemical symbol for iron, a circle with an arrow pointing diagonally upwards to the right, was adopted as a logotype. This is one of the oldest and most common ideograms in Western culture and originally stood for the planet Mars in the Roman Empire. Because it also symbolised the Roman god of warfare, Mars, and the masculine gender (as every bird-watcher can tell), an early relationship was established between the Mars symbol and the metal from which most weapons were made at the time, iron. The logotype was complemented with a diagonal band running across the radiator, already on the first car in April 1927. The band was originally a technical necessity to keep the chrome badge in place but it gradually developed as more of a decorative symbol. It is still found across the grille of every Volvo vehicle. Now, however, you will also find the iron symbol in a slightly modernized form in the centre of the steering wheel and the wheel hubs, and in all communications material such as advertisements, brochures, stationery, Internet sites, merchandise and so on. In 1999, the Volvo Car Corporation was sold by its owner AB Volvo to Ford Motor Company. One reservation was stipulated, however: that the brand name should be used also in the future by both Volvo Cars and the rest of the companies in the Volvo Group.